WHAT WERE THE MOST-VIEWED Minnesota Prairie Roots posts during 2010? Surprisingly, three of the posts which are in the top five this year were also in the top five last year. But I’m going to keep you in suspense about those posts as we count down, beginning with the 10th most-viewed post in 2010. 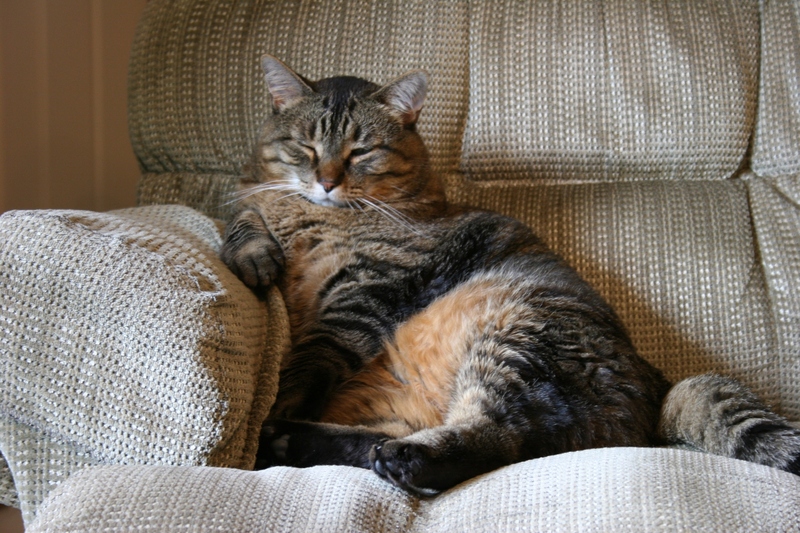 10) “Inspired by Dr. Seuss: My sister’s fat cat,” a Dr. Seuss-type poem published along with three photos of my sister’s cat came in at number 10 with 392 views. My sister's fat cat, Sable. 9) Whenever I write about old churches, I’m almost guaranteed that my readership that day will soar. So I was not surprised to learn that “Inside the 1894 Valley Grove Church” ranks as my ninth most popular post for 2010 with 411 views. In this story, I take readers inside the historic hilltop country church near Nerstrand. 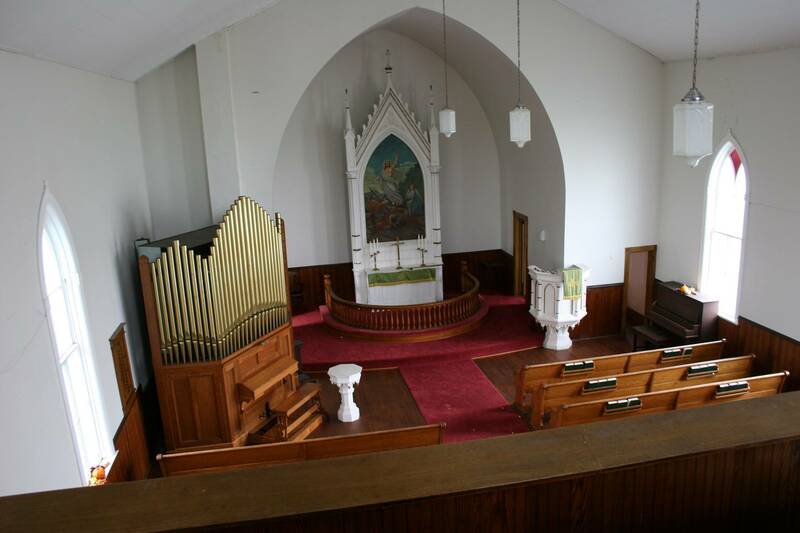 Simplistic Norwegian style inside the 1894 Valley Grove Church, as viewed from the balcony. 8.) I have no idea why “Saturday ‘steals’ (deals)” held so much interest for Minnesota Prairie Roots readers. Maybe the 447 viewers who clicked on this story are avid garage-salers, just like me, looking for a deal. 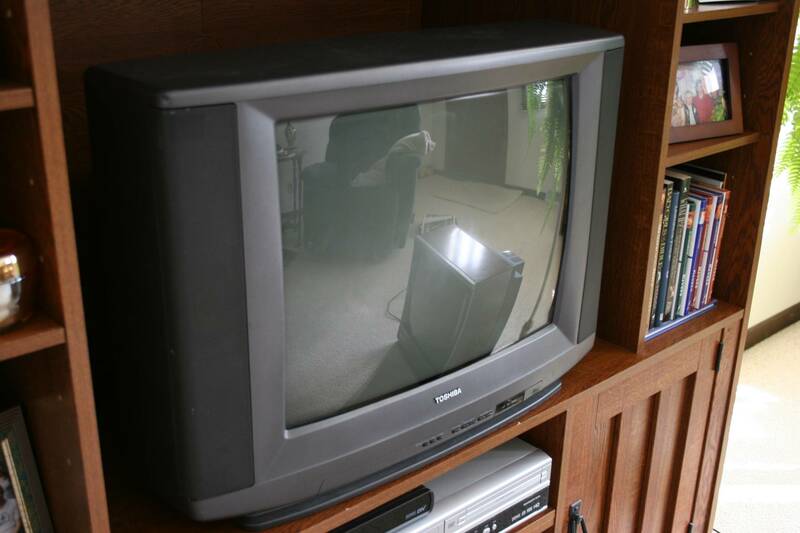 The "new" Toshiba TV my husband got for free at a church rummage sale. 7) Like churches, barns bring lots of readers to Minnesota Prairie Roots. In “I love old barns,” I show readers the barn where I labored as a child—feeding cows, scooping manure, bedding straw and more. This post got 484 views. 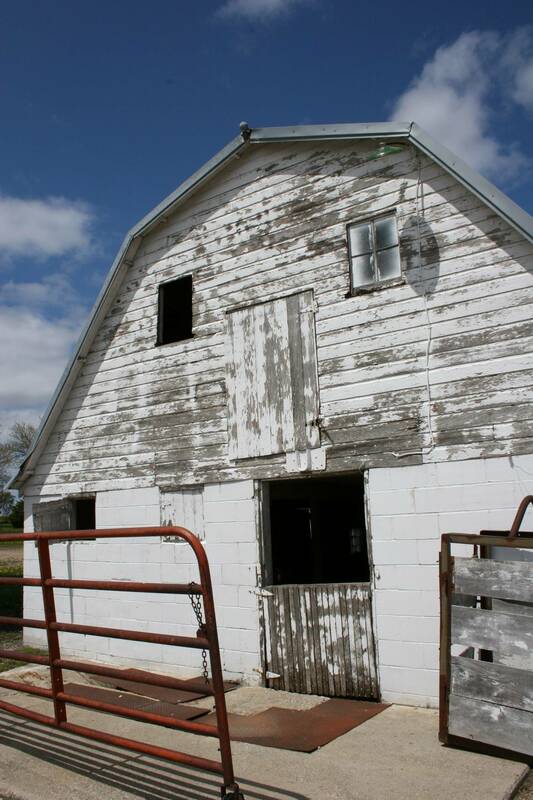 The early 1950s barn on the Redwood County dairy farm where I grew up is no longer used. 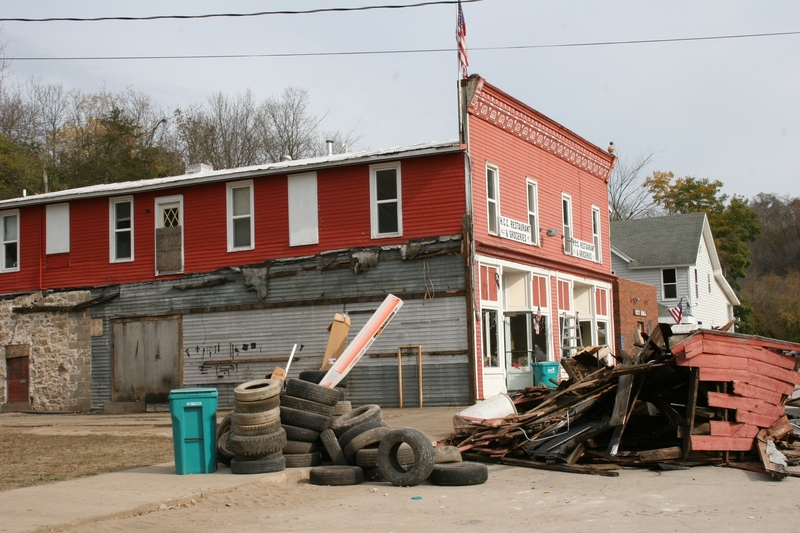 6) When floods ravaged southern Minnesota this fall, I was there, photographing the disaster and interviewing survivors. My “Flooding in Faribault” post (among numerous flood stories) got 519 views. 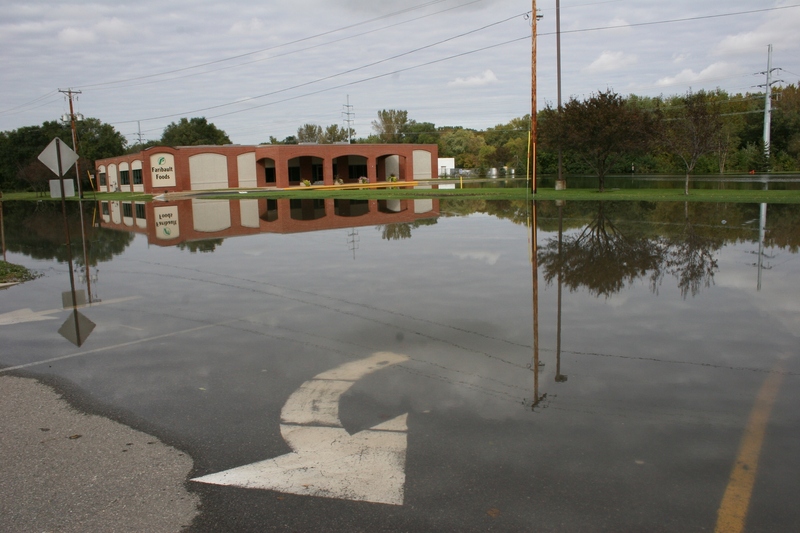 A roadway arrow on flooded Second Avenue N.W. by the Faribault Foods office directs motorists into North Alexander Park. 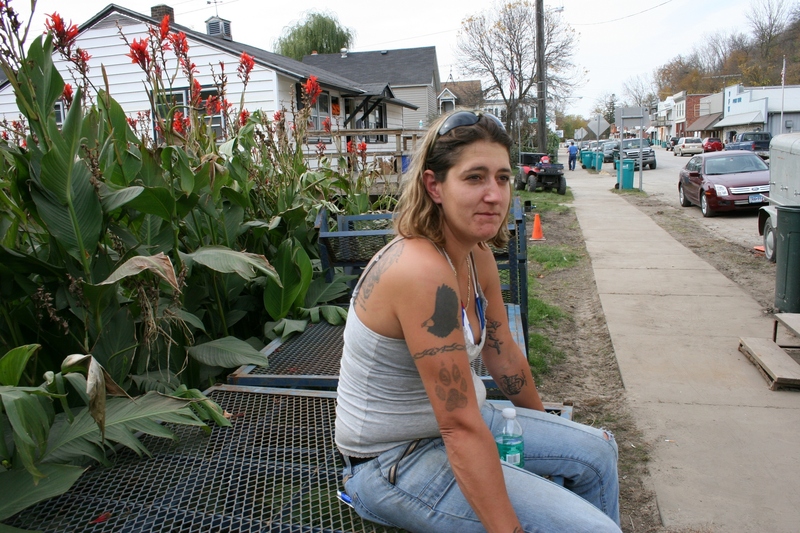 5) “Henna tattoos and body art by a “gypsy woman,” which was the fourth most popular in 2009, fell a notch to fifth place in 2010. 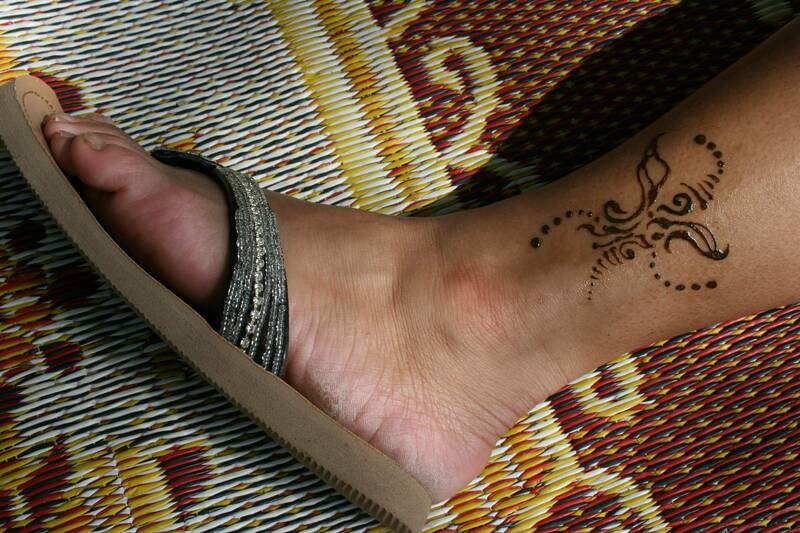 I still cannot figure out why this story about a henna tattoo artist at the Kenyon Rose Fest has drawn so much interest, with 530 views in 2010. 4) “An autumn drive in Rice County, Minnesota” attracted 549 views as I took readers on a Sunday afternoon drive through the countryside. Local tourism officials, take note. I’ve done my share to draw attention to the Faribault area. 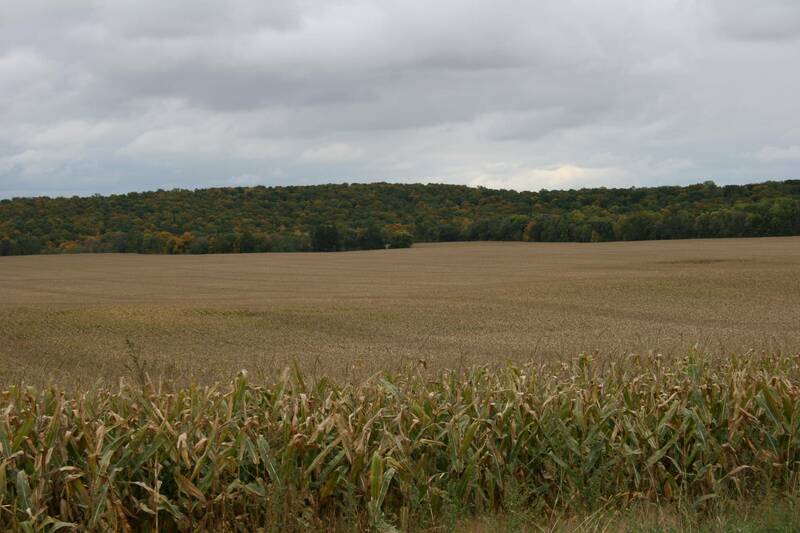 A corn field ripens against a back drop of trees. 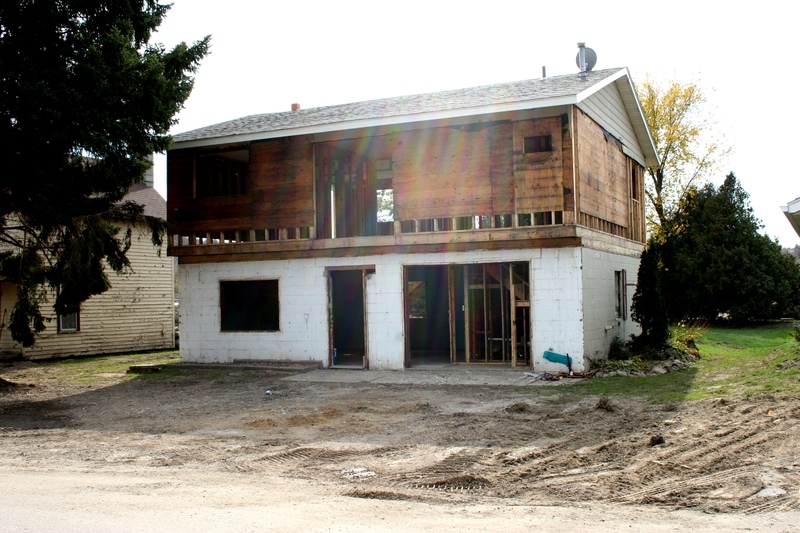 3) “Preserving the past at Immanuel, Courtland, MN.,” which was the most- read post last year, slipped to third in 2010 with 623 views. In this story, I take readers inside the home congregation of my maternal forefathers. 2) The second-place ranking of “In praise of preserving country churches” does not surprise me as this post was featured on the homepage of WordPress.com on July 10. The Freshly Presssed selection garnered a record number of blog visitors, 1,052, on a single day. This post had 1,304 views in 2010. 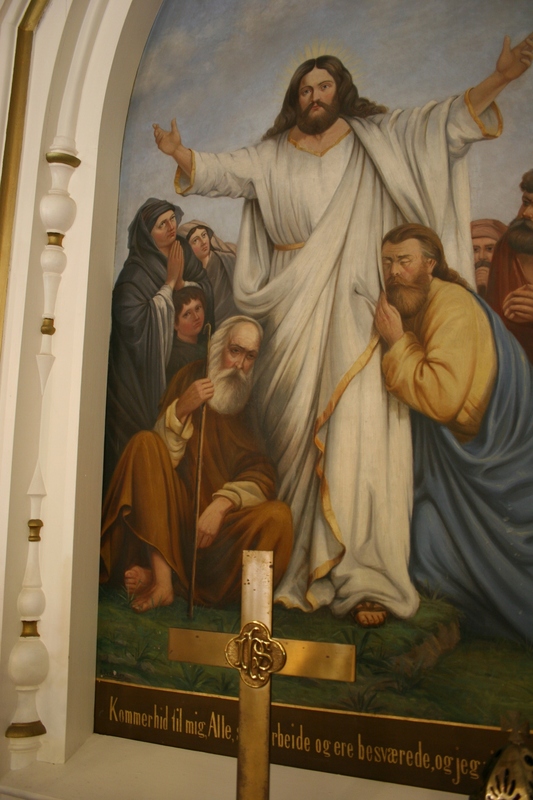 An altar painting was transported to Moland Lutheran Church south of Kenyon by horse-drawn wagon from Faribault in 1893. 1) Finally. 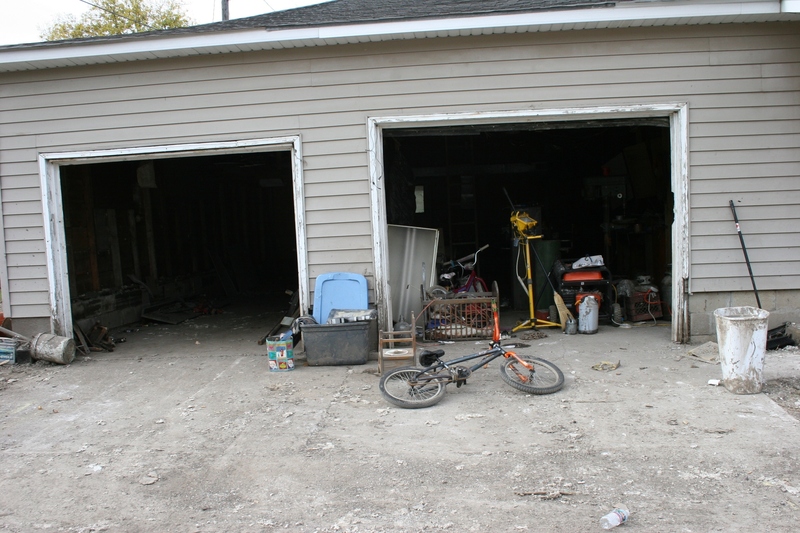 Number uno, the most viewed post during 2010 was written on November 5, 2009, following a presentation at Faribault High School. “Rachel’s Challenge: Start a chain reaction of kindness,” about the 1999 Columbine High School massacre, got 1,702 views. Last year, this was also one of my most popular stories, coming in at number five. 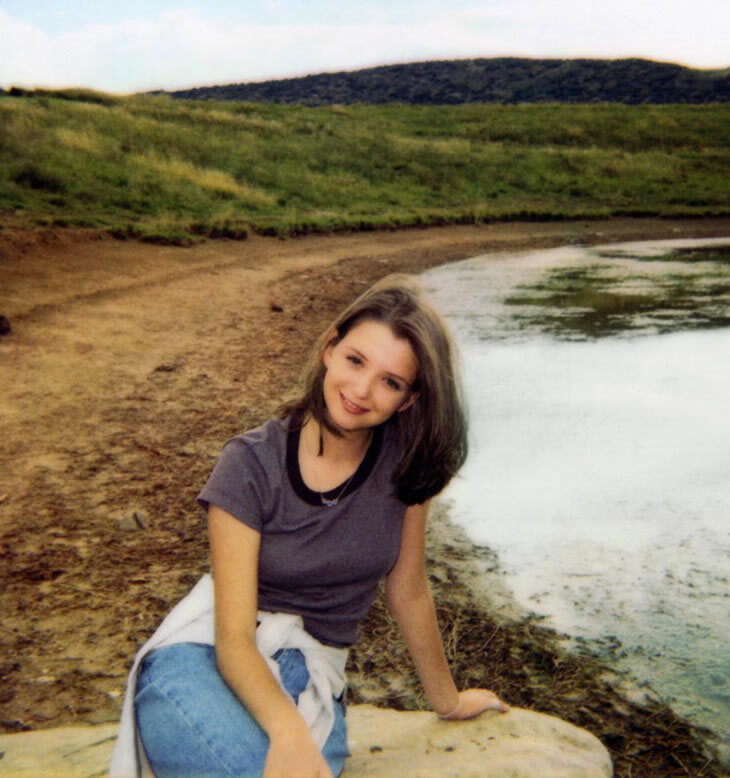 Rachel Scott, who died at Columbine, and the inspiration for Rachel's Challenge. I wish I could explain the reasons behind the top 10 rankings. 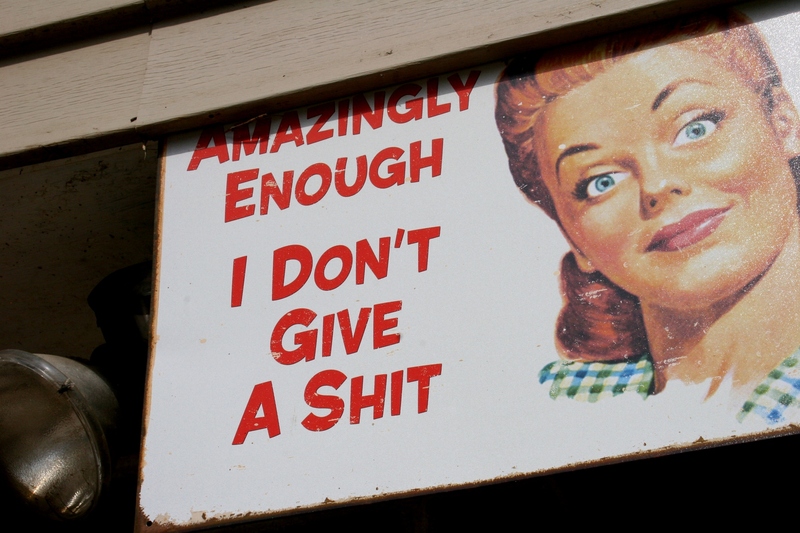 Some I can. 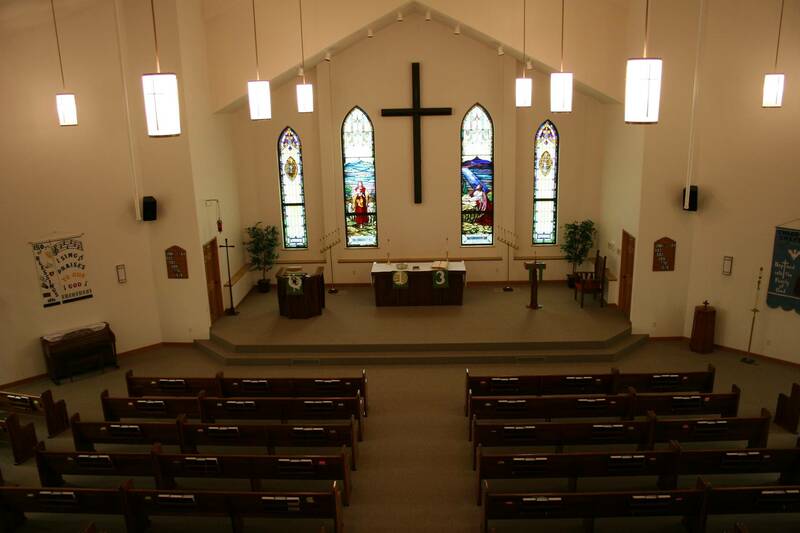 I’ve noticed that certain topics—like churches and barns—really interest readers. But henna tattoos and fat cats? Figure that out. IF YOU MISSED ANY of these most-viewed posts, click on the highlighted titles/words, which will link you to the stories. DISCLAIMER: These are unscientific results given I simply pulled stats from my administrative page but did not factor in how long, for example, a post has been on Minnesota Prairie Roots. That can skew numbers. However, I am confident the above summary is fairly accurate. CHECK BACK FOR MY PERSONAL favorite posts of the year. WHAT DID YOU GET for Christmas? Anything interesting, fun, different? This wind-up NunZilla walked and shot fiery sparks from her mouth. Sadly, the toy worked only briefly. The gift our second eldest gave to her father ranks as the most entertaining and unusual of all the presents exchanged in our household. Having heard her dad’s stories about attending a Catholic grade school, our daughter picked up a NunZilla at Vagabond Imports in Appleton, Wisconsin. 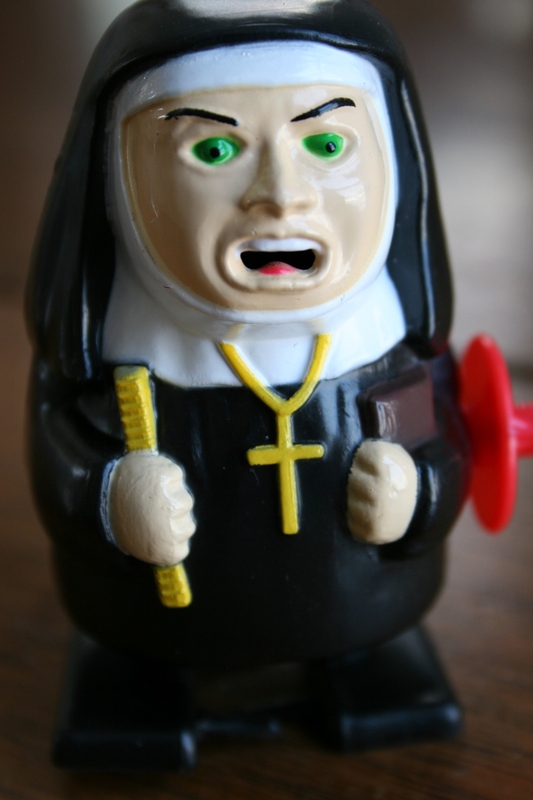 The sparking, walking, ruler-toting wind-up toy nun proved to be the perfect humorous gift for a man who endured the physical punishment of a sister or two during his childhood. He’s never explained why the nuns slapped his hands with a ruler or dug a thumb into his scalp. Apparently they thought he was misbehaving. He can laugh about it now, kind of. I don’t condone corporal punishment. However, times were different back in the 1960s and teachers, unfortunately, got away with such physical abuse. Sad, but true. I can’t speak from first-hand experience (because I did not grow up Catholic), but I would like to believe that the ruler-slapping nuns were in the minority and that most were kind and caring. Another Christmas gift also drew my attention, or should I say my husband’s attention. 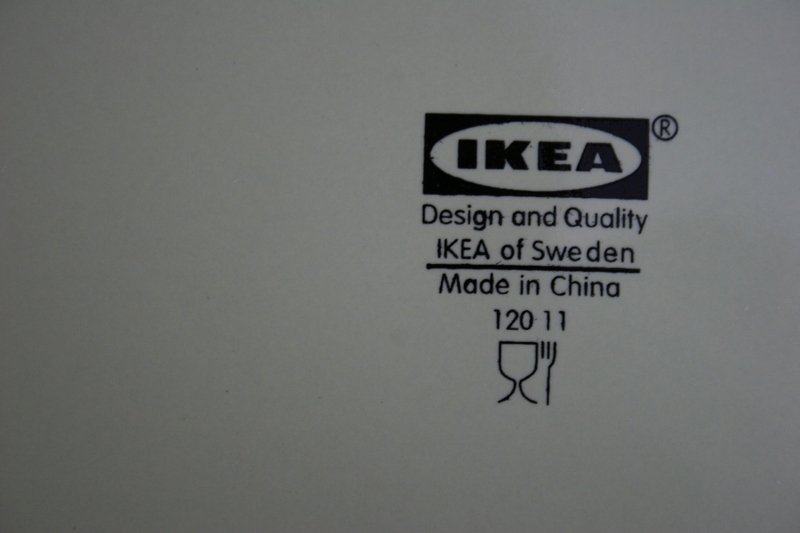 As he washed the eight new dinner plates that our eldest gave me, he noticed that the “IKEA of Sweden” plates were “made in China.” No need to say more on that one. FYI, the wind-up NunZilla was also made in China. Finally, the ghost of Annie Mary Twente, a 6-year-old girl who was buried alive near Hanska, Minnesota, in 1886, remembered me with a Christmas gift. For the second consecutive year, she (AKA my cousin Dawn and Aunt Marilyn) sent me a book about mice. She knows how much I detest rodents and takes great delight in taunting me. The book was not—I don’t think—printed in China. The imprint on the bottom on my new IKEA plates. But the other part of Annie Mary’s gift, a combination calendar and notepad decorated with chickens (of which I am not fond), was manufactured in China. HOW ABOUT YOU? Did you receive any memorable Christmas gifts? Humorous or otherwise? Submit a comment to Minnesota Prairie Roots. I’d love to hear your stories. IF I WAS A KID, I would have been genuinely super-excited to see this oversized Rudolph the Red-Nosed Reindeer outside of Sleepy Eye on Christmas Eve afternoon. 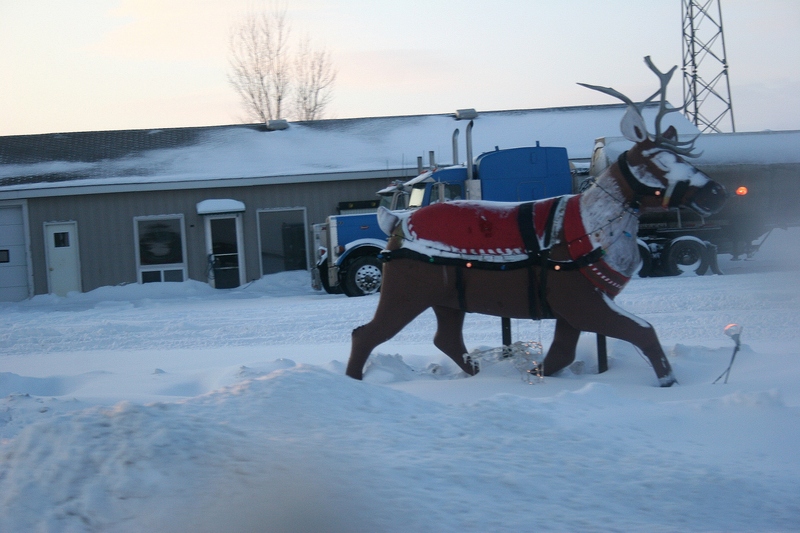 I photographed Sleepy Eye's Rudolph the Red-Nosed Reindeer while traveling to southwestern Minnesota on Christmas Eve afternoon. I would have been firing off questions after first exclaiming, “Look, Mom, Rudolph, Rudolph! Yes, I would have been full of questions, just like I am today. Why is this lone Rudolph prancing in the snow along U.S. Highway 14 on the eastern edge of Sleepy Eye, right before you round the curve into town? Is this reindeer always there, or only at Christmas? Where did he come from? But, really, does anyone know? WHEN I LOOKED through the patio doors of my middle brother’s rural Redwood County home on Christmas morning, I saw this picture-perfect postcard scene. 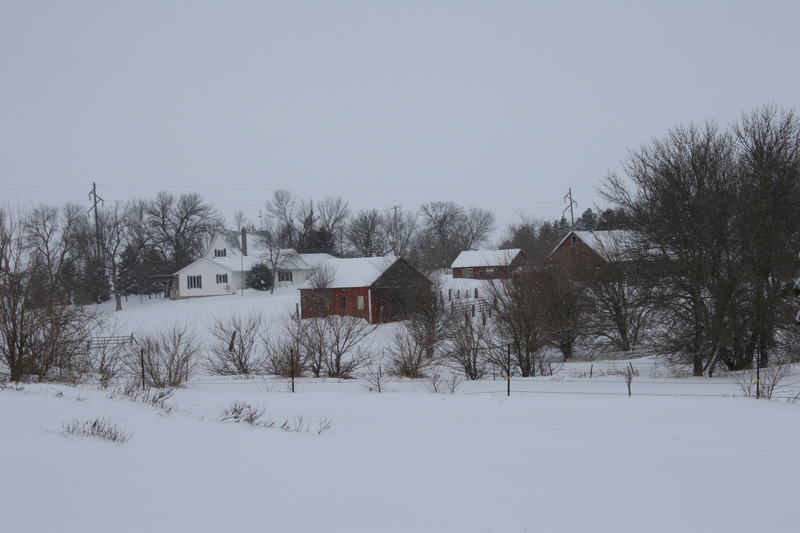 A farm place near Lamberton on Christmas Day morning. The quaint farm place sits along Redwood County Road 6 near Lamberton, just north of the county park I call the “gypsy park” because my paternal grandma told me gypsies once camped there. From the park, the farm site lies only a short distance from an electrical substation which, during my growing up years, my siblings and I dubbed “the chicken pox factory.” It was a name we gave to all such substations, I suspect around the time chicken pox plagued the area. Ironically, the brother who now lives near the chicken pox factory never had the disease. But I am getting sidetracked here. I wanted to share this photo with you for several reasons. First, this winter in Minnesota is quickly becoming long and wearisome with all of the snow we’ve gotten recently. That’s why it’s more important than ever to search for the positive (which I have not been too good at lately) in winter. For me, that means viewing the landscape as a photo opportunity. Photography forces you to really see, not simply look at, the details in your environment. While composing this image, I noticed the contrast of the red buildings against the pristine white snow, the defined fencelines, the old farmhouse that surely has many stories to tell, the slight rise of the land, the shelter belt of trees protecting the farm from the fierce prairie winds. With a gentle snow falling, the scene possessed a dreamy, peaceful, surreal quality. So, yes, when you make a conscious effort, you truly will find beauty in this winter of overwhelming snow. I HAD THIS EPIPHANY, this brilliant moment, the other night as I watched my husband swing his scoop shovel at icicles hanging from the house roofline. 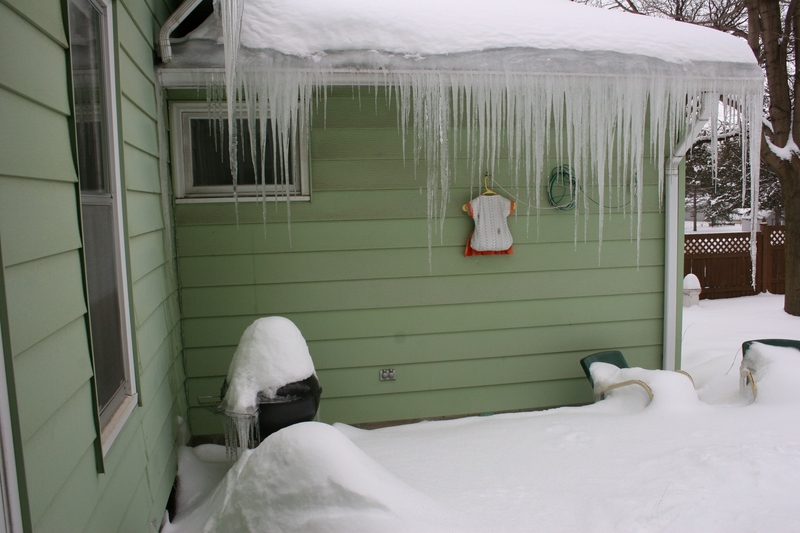 He had just descended the ladder after scooping several snowstorms worth of snow from the roof when he began knocking mega icicles from the ice-dammed eave troughs with his shovel. Clank. Clank. Clank. For days I had admired the growing length of those icicles, the longest of which stretched to perhaps six feet. What extraordinary weapons they would make for sword fights, I thought. But, the practical homeowner in me realized we needed to remove the weaponry to protect the fort, AKA our house. Ice dams and icicles on the west side of our house. So, Thursday afternoon I walked across the street to borrow a roof rake from my neighbor. For perhaps 45 minutes I floundered in thigh deep snow banks, pulling snow from the house and garage roofs until I felt like my arms would fall off. 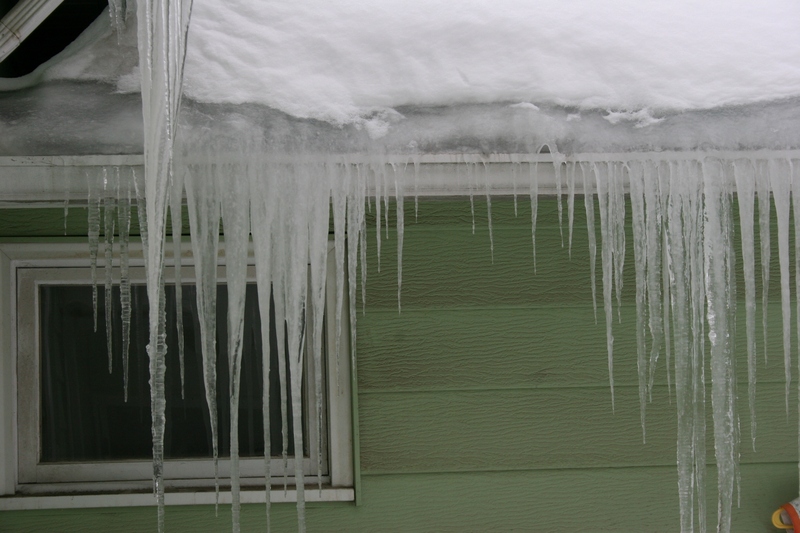 I also knocked down as many of those icicles as I possibly could until I came dangerously close to also knocking out the bathroom window. I nearly hit the bathroom window while removing snow and icicles from the house. Anyway, back to that light bulb moment. “Do we have any ice for the cooler?” I hollered to my husband as he hammered away at the icicles I had missed during my earlier reckless attempt at destroying the ice build-up. By this time, the attack with a scoop shovel method was no longer working. Fortunately for me, I have a husband who doesn’t always dismiss my seemingly crazy ideas. 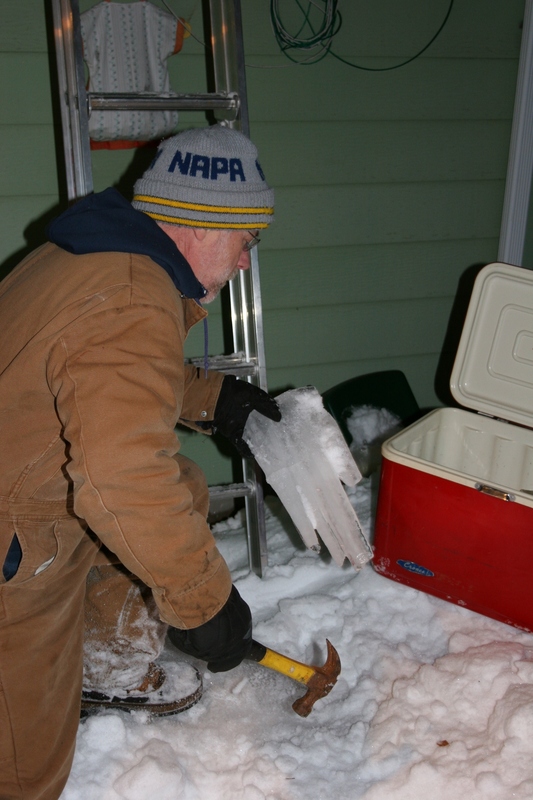 I dragged a cooler up from the basement, handed it outside to him and he continued hammering the ice until we had a whole cooler full of icicles. My husband begins the task of harvesting icicles with a hammer. 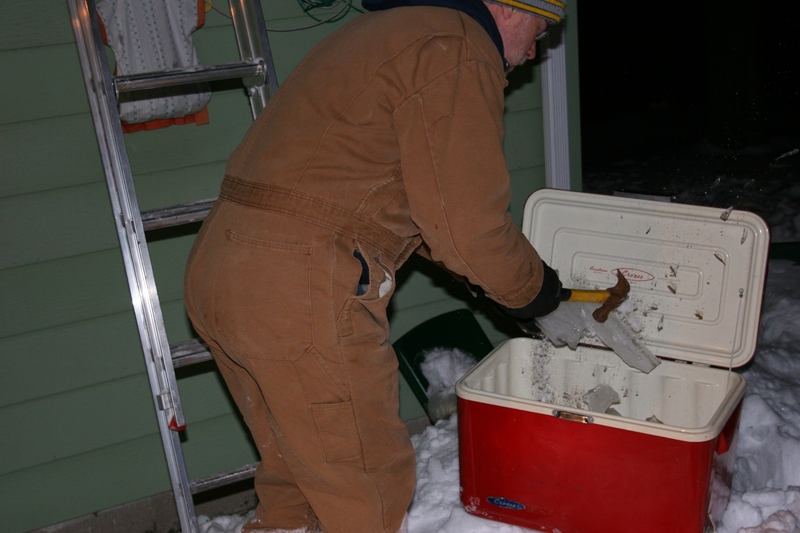 Ice chips fly as Randy breaks the icicles into smaller chunks that will fit into the cooler. 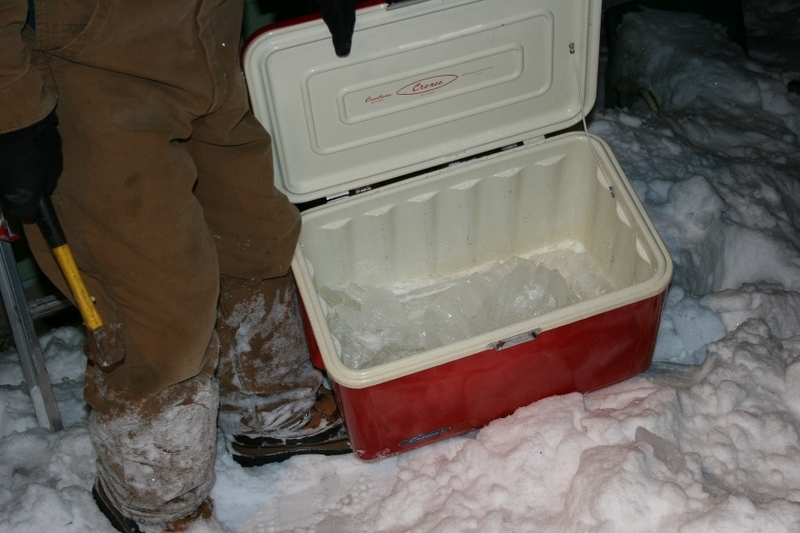 The cooler was only half full of icicle chunks when frozen fingers led me to stop photographing the ice harvest. Our teenage son made some comment about saving the ice until summer, putting a modern day spin on the concept of harvesting lake ice and packing it in sawdust inside an ice house. Now, if you were to peek inside the chest freezer in my basement, you would find, um, yes, broken segments of icicles that will work perfectly for chilling beverages this summer. 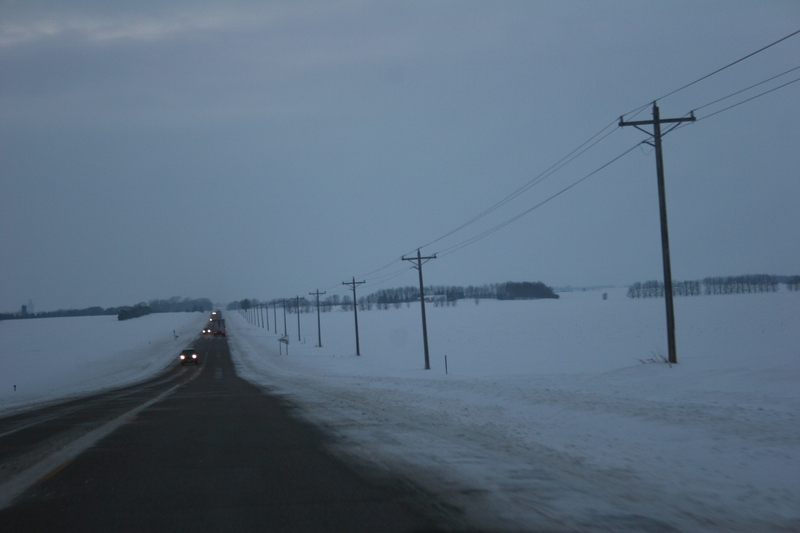 We drove along U.S. Highway 14 as we traveled to southwestern Minnesota for Christmas. 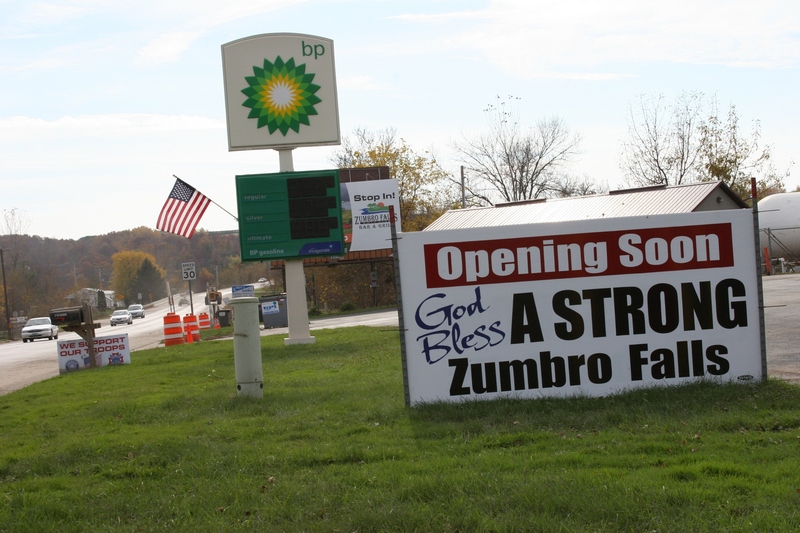 This stretch is between the Sanborn corners and Lamberton. 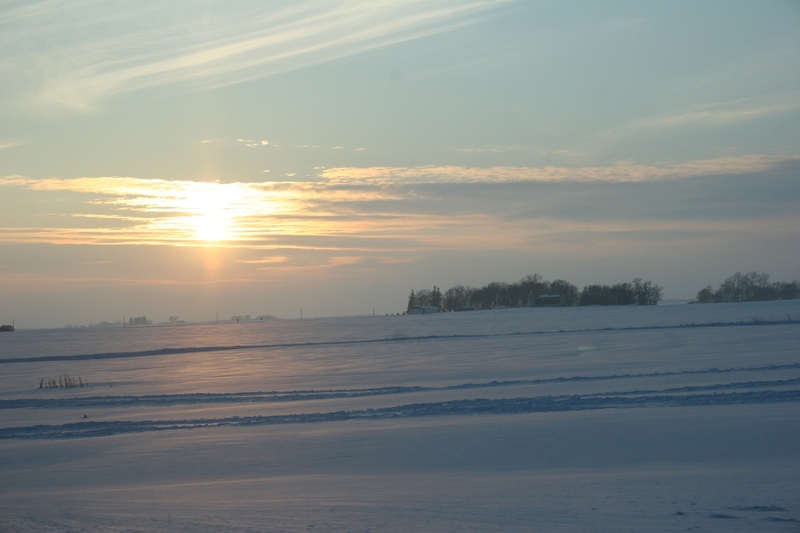 FOR THE FIRST TIME in decades, my family and I celebrated Christmas Eve with my mom and four of my five siblings, and their families, “back home” on the southwestern Minnesota prairie. It was my mom’s wish that all of us be there, attending Christmas Eve church services with her at our home church, St. John’s Lutheran in Vesta. Our Christmas together was as wonderful and memorable and as full of laughter and love as I expected it would be. Initially, I doubted that we would make the 2 ½-hour trip west given the steady snow that began falling early Christmas Eve, slicking the highways and creating difficult driving conditions. But by the time we left Faribault around 2:30 p.m. Friday, the snow had stopped and major highways were clear. So, with the trunk packed full of luggage, air mattresses and sleeping bags, presents and coolers, the five of us crammed ourselves into the car (along with pillows and board games on our laps) for the journey to Redwood County. We were headed first to my brother’s house just north of Lamberton. 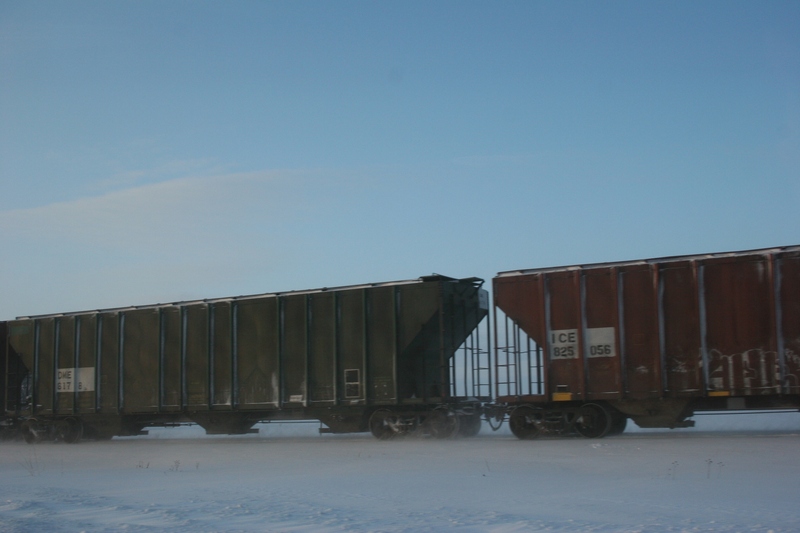 A train travels east along U.S. Highway 14 between Essig and Sleepy Eye while we travel west. 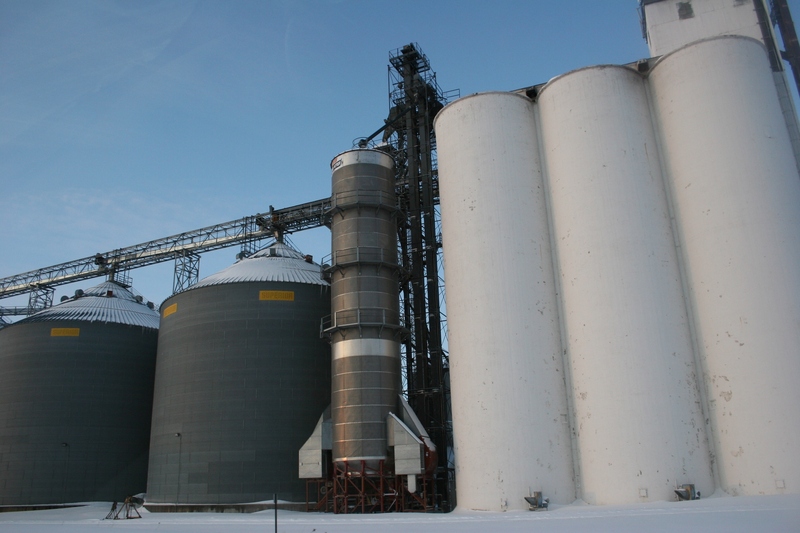 I love this land of plowed fields and wide open spaces, of small-town grain elevators occasionally punctuating the vast skies, of cozy farm sites sheltered by barren trees. 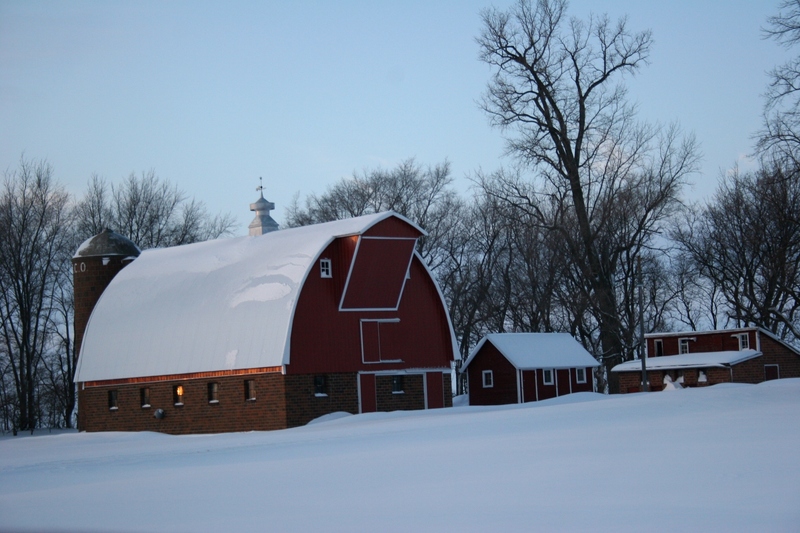 I love, especially, the red barns accented by the fresh-fallen snow, portraying an agrarian beauty that perhaps only someone who grew up on a farm can appreciate. As much as I have disliked all of the snow we’ve had this winter, I saw only a beautiful winter wonderland when I was back home for Christmas on the prairie. The sun begins setting over the prairie as we head west, passing through Sleepy Eye and Springfield before reaching Lamberton. We saw only occasional glimpses of sun on a mostly gray day. The elevators in Sleepy Eye. Small-town prairie elevators like this can be seen for miles away. One of many picturesque barns along U.S. Highway 14. 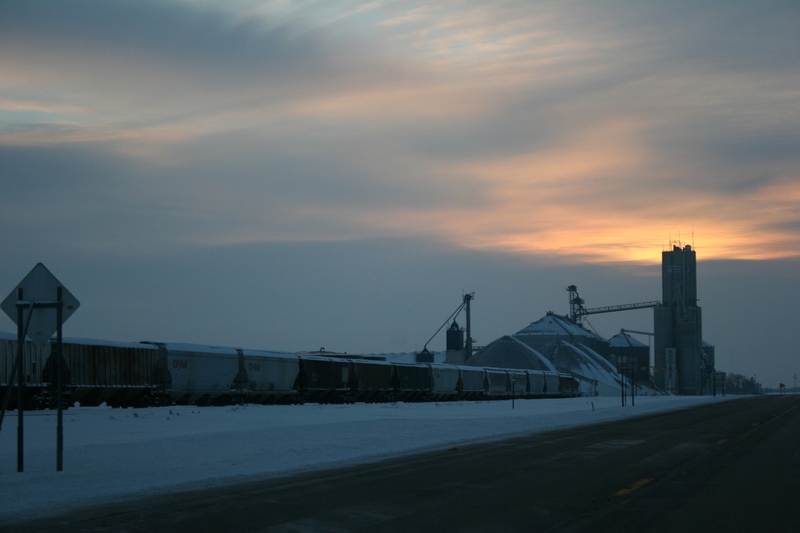 Elevators and trains are a common site along U.S. Highway 14 in the rich farmland of southwestern Minnesota. We've nearly reached our destination when I photograph this elevator complex near sunset.